This is one of my favorite photos of this engine, looking well maintained but not just out-shopped. She looks ready to depart for the day with a faint trace of smoke rising from her stack. Good color photos are not that common and this one is nice. Clearly visible are the white stripes on the running boards and tender as well as the yellow diamond logo on the cab. Notice the firebox is painted light. Even the weathering on the drivers and running gear is just like a modeler would do it! One thing unusual about the photo is the direction the engine is facing. It's sitting in the Dundon yard but facing the engine house, opposite the normal direction for engines in the yard as they were normally turned on the Avoca wye before returning the the yard. The diamond logo dates this photo as sometime after 1959. Consolidation #14 was the only BC&G locomotive purchased new, although three Climax were purchased new for the ERC&L logging activity. The story goes that the engine was built by Baldwin for the National Railway of Mexico but that J.G. Bradley made a personal visit to Baldwin and got them to sell the engine to the BC&G. (See item below). It was originally configured to burn oil. Modifications made by the BC&G included installation of the cylindrical air tank on the pilot, a feature installed on all BC&G engines. 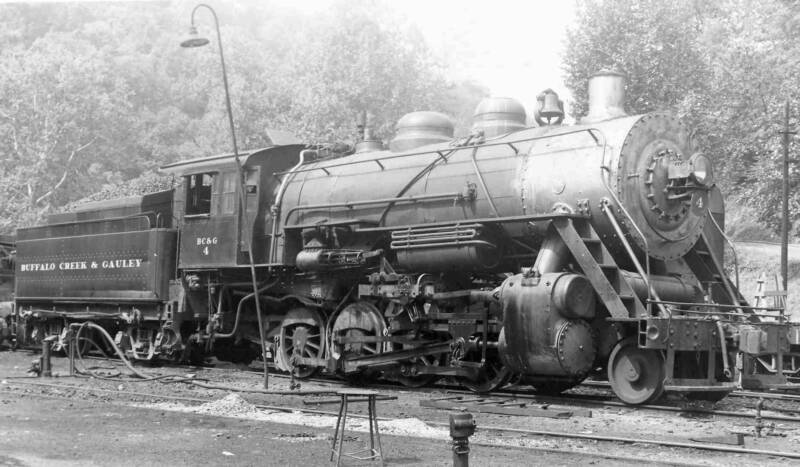 According to a newletter 2007 newsletter from the North Carolina Transportation Museum, around 1970 when this engine was in tourist service with the Quakerstown & Eastern RR, a Mr. William Young affectionately started referring to her as 'Ole Slobber Face' as a result of the moisture that was constantly falling on her from her own stack. She was an unsaturated steam engine and her 'face' was always wet. The name stuck and this nomer has been applied widely since. Here's an equally nice photo of the engineer's side of #4. This is an earlier photo as the diamond logo is not on the cab. The pilot-mounted air tank is clearly visible in this view. In most photos the number plate under the headligth is read with brass lettering, as in the color photo above. In a few color photos, the background of the number plate is a light brown or gold with brass lettering. This undated photo is interesting because it shows #4 closer to her as-delivered configuration. The engine looks very new suggesting this photo might have been taken soon after she arrived at the BC&G. The headlight is high-mounted, as it came from the factory and the air tank has not yet been installed on the pilot. Notice that there is pretty elegant pinstriping on the tender. While all three of the BC&G Consolidations that were in service when the line closed in 1965 have survived, engine #4 has faired the best, by far. At the present time she is owned by the North Carolina Transportation Museum in Spence, NC. For a number of years she was in regular tourist service there on a small loop of track. The two photos above were taken in 1995 at a "BC&G Reunion Day" organized to celebrate the 30th anniversary of #4 final revenue run from Swandale to Dundon. The engine was relettered for the BC&G courtesy of a large magnetic sign on the tender and diamond logos on the cab. The cab windows were reversed so the green showed on the outside as the BC&G engines had green cab windows as is visible in the top photo on this page. The number plate under the headlight is a reproduction made for this occassion. About 6 were made and were sold to participants of the weekend event. I have one in my collection and it is one of my most prized memoribilia items. Both photos by Brooks Stover. While this is not a very clear rendition of this photo, I've included because it is one of the few color photos that shows the red tender deck that appeared on the BC&G Consolidations in the later years. Notice the spiffy cable with red hooks on the tender chassis. This photograph by John Phillips reveals the top of the tender deck on #4 as it was in May of 1963. Note the the backup light is now on a pedestal in the center of the tender deck instead of at the very rear as in the photo above. .
Martin Hansen has a provided the three images here which shed substantial information about #4. The document above is from the Baldwin Locomotive Works Construction Number Records. It shows that an engine was delivered to the BC&G in September of 1926. Further, reading at the bottom reveals that the engine was part of a group of 10 that were slated to go to the Mexican Government Railway as oil burners in 1926. On the left above are images of the front and back of a number plate in the collection of Martin Hansen. At first it would appear that this plate has no connection to BC&G #4, but Martin's research shows otherwise. The numbers imprinted on the back along with the document above right show that it is, in fact, the original number plate from #4. The number code is translated as follows: 10 stands for the total number of wheels (2-8-0); the 38 is a code for the cylinder diameter of 22" (determined by dividing 38 by two and adding 3); the letter E is a code for the number of drivers; and the last four numbers (3758) represents this to be the 3,758th engine built with this wheel configuration and cylinder size. Now for the number 2 on the front. 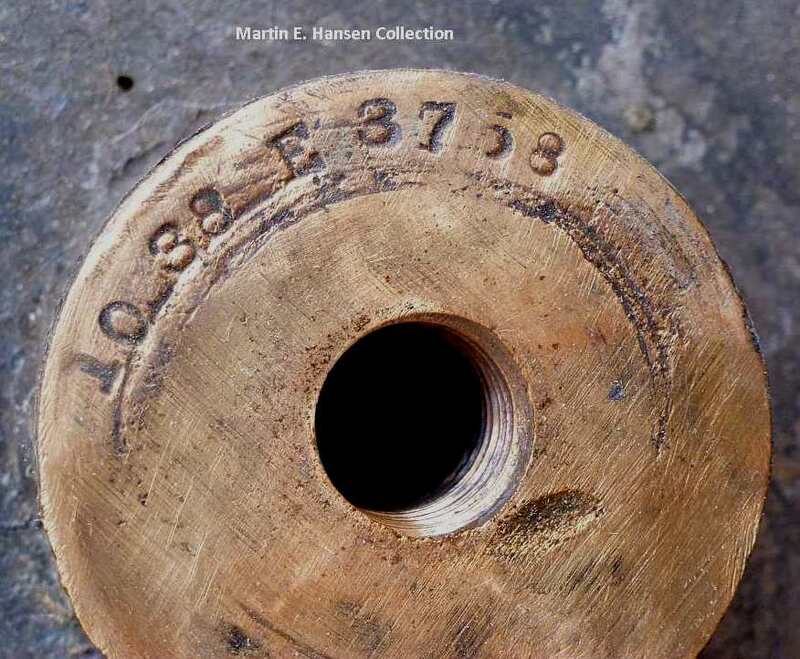 Martin reports that the numeral is screwed onto the front of the plate and there is no cast in number beneath. There a couple of possible explanations, both speculation. 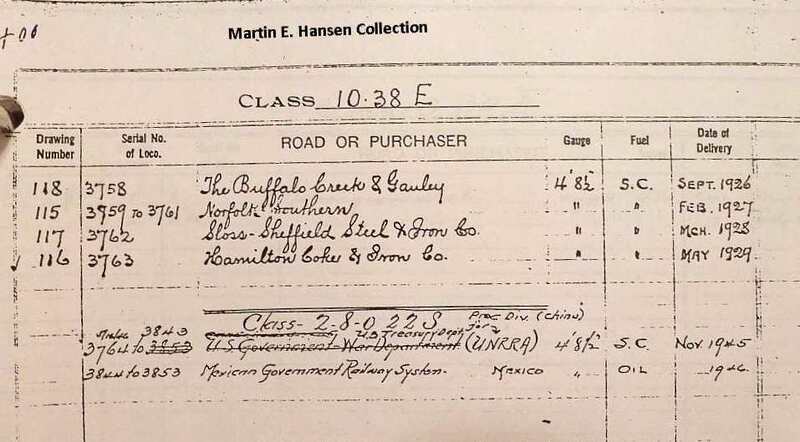 The number plate may have been delivered with no numeral with the expectation that the Mexcian railway would put a number on, or it was cast with the Mexican railway's number but the number was ground off before the sale to the BC&G. The numeral 2 must have been put on by one of the tourist railroads that owned the #4 after she left the BC&G. More research is needed on this. Three photos by Martin Hansen of items from his collection..
BC&G #4 TO RUN AGAIN! To read the latest update from DURBIN & GREENBRIER VALLEY RR scroll to the bottom of this page. 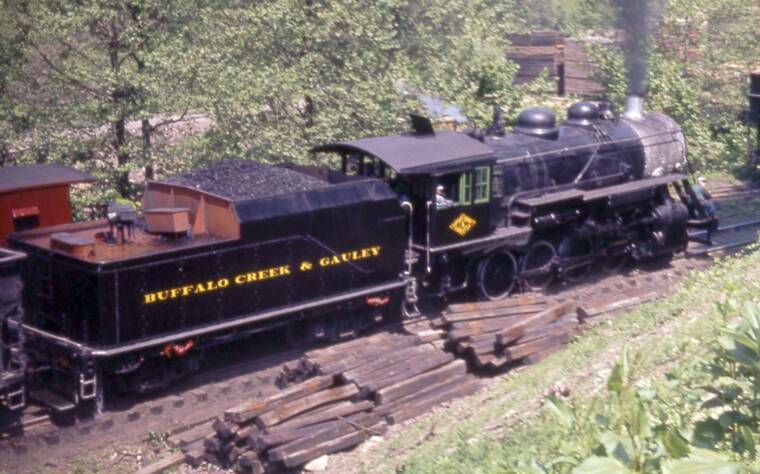 SPENCER, N.C. – The North Carolina Transportation Museum Foundation has reached an agreement to sell Buffalo Creek & Gauley 2-8-0 No. 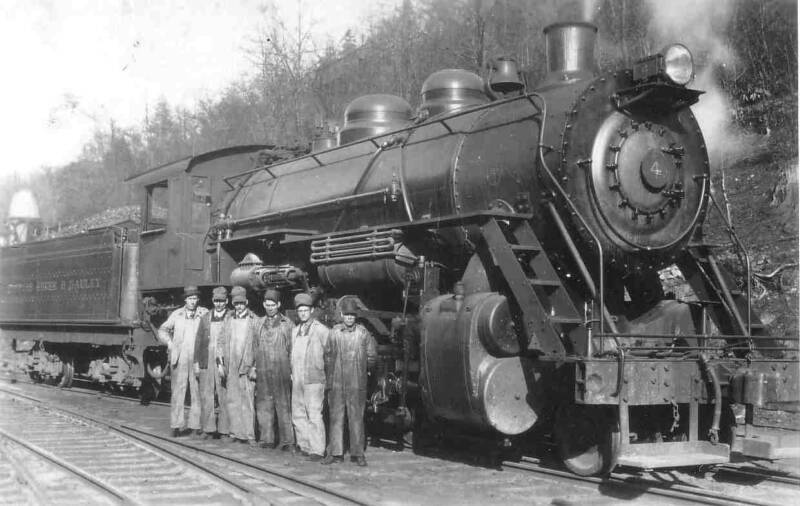 4, a 1926 Baldwin-built steam locomotive with deep West Virginia roots, to the Durbin & Greenbrier Valley Railroad for restoration and operation in the Mountain State. 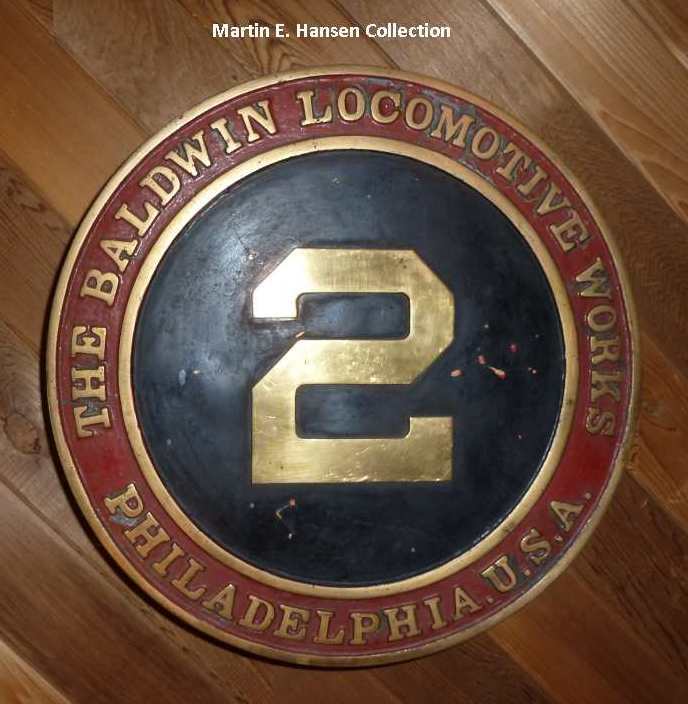 The Baldwin Locomotive Works in Philadelphia, Pa., built the locomotive for use in Mexico, but instead it was sold to the Buffalo Creek & Gauley in Clay County, W.Va. It became one of the most photographed steam locomotives in the Eastern U.S., making its last run in 1965. The locomotive was sold to the Pennsylvania-based Quakertown & Eastern excursion operation in 1967, the Southwest Virginia Scenic Railroad in Hiltons, Va., in 1972, and the non-profit support organization for the North Carolina Transportation Museum in 1978. It was restored in 1986 and lettered and numbered as a replica of Southern Railway 2-8-0 No. 604, which had been based at Spencer. The locomotive pulled the museum’s 3-mile on-site train ride for years. 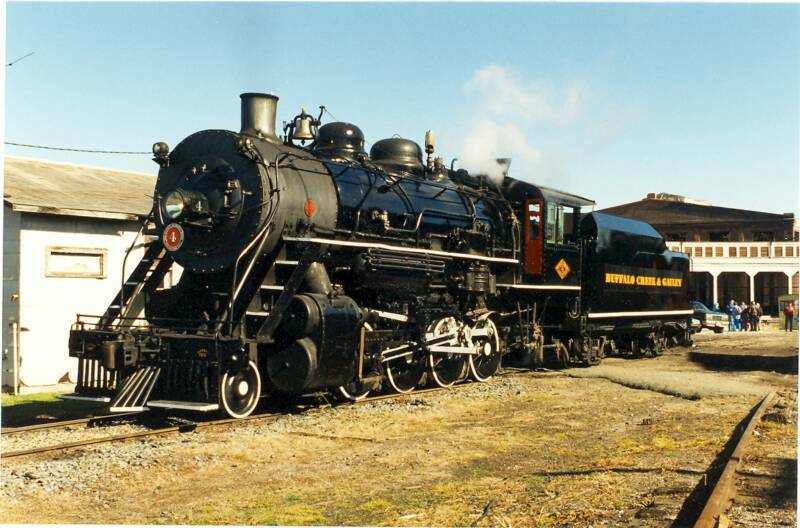 It last operated in November 2001 and was partially restored in the 2000s before other priorities at the museum resulted in the restoration being stopped. The locomotive was the first piece of rolling stock that a group of Southern Railway retirees restored at Spencer in 1986, a move that is regarded as the turning point for the North Carolina museum that today is the home to the largest preserved roundhouse in the nation, hosts major events such as 2014’s Streamliners at Spencer festival, and is serving as the site for the restoration of Norfolk & Western Class J No. 611. Proceeds from the sale will be used to upgrade the museum’s permanent rolling stock. "We are looking forward to returning this historic West Virginia steam locomotive to service not far from where she once operated. We are truly thankful to the North Carolina Transportation Museum Foundation for entrusting us to carry on the legacy of the Buffalo Creek and Gauley No. 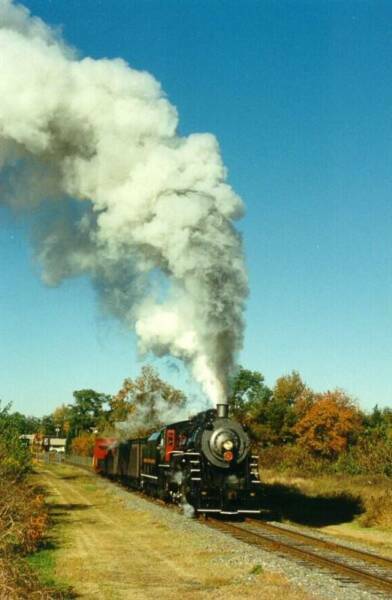 4 steam locomotive,” said Durbin & Greenbrier Valley President John Smith. “We know it’s been the dream of many who have contributed to the preservation of this engine over the years to see it under a full head of steam and on the tracks again. The Durbin & Greenbrier Valley Railroad is proud to be a part of making this happen." SPENCER, N.C. – The fabled, well–traveled, and much beloved Consolidation known as “Old Slobberface,” Buffalo Creek & Gauley No. 4, an icon of the last gasp of regular steam-powered freight in the early 1960s, is on its way home today. A convoy of four tractor-trailers was moving the 1926 Baldwin from its long-term home at the North Carolina Transportation Museum to its new owners at the Durbin & Greenbrier Valley Railroad in West Virginia, the state where it spent its entire working career. A crane hoisted the boiler, running gear, flues, cab, and miscellaneous parts for the locomotive that last ran in 2001. It was the subject of an aborted restoration at Spencer that led to its sale to new owners with plans to restore it by 2016 and operate it along the Greenbrier River. 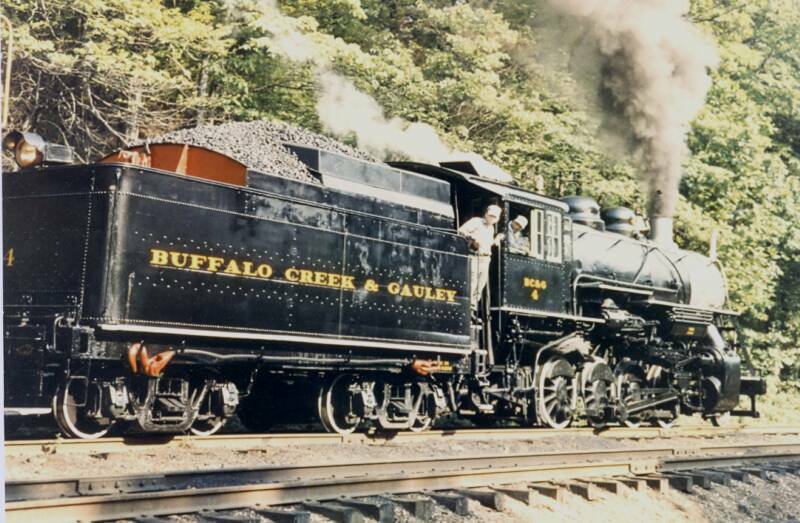 The locomotive was a favorite of steam-starved railfan photographers in the 1960s who found the Buffalo Creek & Gauley’s locomotives and homespun charm irresistible. After the BC&G shut down in 1965, No. 4 worked for the Quakertown & Eastern tourist railroad in Pennsylvania and the Southwest Virginia Scenic in Hiltons, Va., before being sold to the non-profit support organization for the new transportation museum in the former Southern Railway shop complex at Spencer. The engine’s restoration by a group of retired Southern Railway employees turned around the museum, and its role in building up the museum is acknowledged by all. Because the engine was a saturated steam engine without superheating, it often had a dirty face, leading to its disgusting nickname. But the desire to see it back in West Virginia pulling line-haul trains was great. 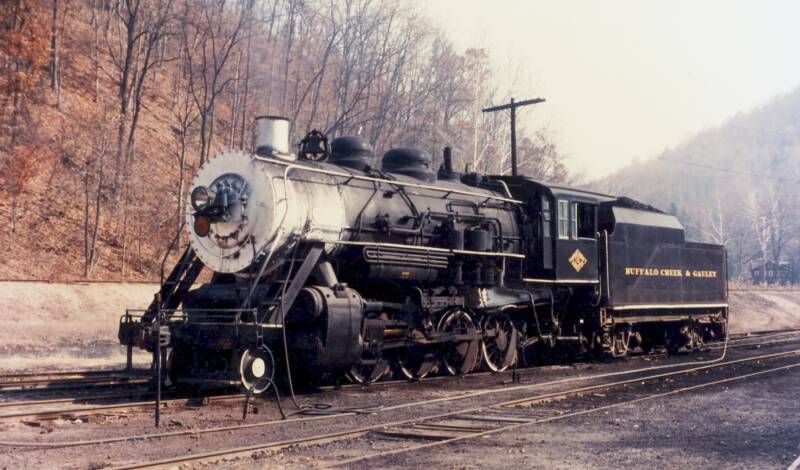 The engine will be rebuilt at the Cass Scenic Railroad for this purpose and returned to the rails of West Virginia. THESE PHOTOS ARE SREEN SHOTS FROM A LIVE STREAMING OF THE LOADING OF #4 FOR TRANSIT TO CASS SPONSORED BY TRAINS MAGAZINE on MAY 20, 2015. Boiler of #4 sitting on her chassis in preparation for loading on a low-boy trailer. Note NW #911 steaming in the background! The boiler was lifted off the chassis and transferred to a low-boy trailer which was rolled under the boiler shortly after this photo was taken. Joe Smith, President of Durbin & Greebrier Valley Railway, owners of BC&G #4, indicates that they’ve made thickness measurements on the areas of concern on the boiler and are working on a plan of action to complete the restoration. Joe says work will more than likely begin in earnest sometime this summer after they complete the FRA Form 4 on Heisler #6 and Climax #3. This is good news, indeed! "BC&G #4 is scheduled to enter the shop late this summer after Climaxes #3 & 9 are completed. The engine will be the regular power on the Cass-Durbin line so we are coordinating the repairs to the locomotive with the track reparis up from Cass along the river. Our plan is to complete the trackwork by late 2017 and have #4 ready at the same time. We have to install the turntable that we purchased from Marienvill, PA at Cass so we can turn the engine at both ends of the line. Hopefully, we can accomplish all of this in the next two years." BC&G fan and Virginia resident Doug Andre recently visited with John Smith at Durbin, WV. John reports that detailed inspection of #4. has shown that the frame, running gear and cylinders are in good shape and will need very little repair. The boiler barrel also appears to be in very good condition. However, the firebox and tube sheets will need quite a bit of work to meet FRA standards. The tender is also in very good condition. John says that work has been delayed by the need to complete work on other important geared locomotives but the restoration of #4 is expected to be complete sometime in 2019. Doug says John's level of enthusiasm remains high for this project and that he is confident it will come to fruition. Number 4 remains a key element in the proposed Durbin & Greenbrier Valley Railway operation between Cass and Durbin.